Don’t Travel as Much as You Want? Here’s how to Fix it. When people find out I’m always traveling, one of the first things they say to me is “Lucky, I wish I could travel!” & I always tell them you can. There’s a lot of different excuses reasons why they can’t travel as much as they want to, or don’t travel as much as they want to..so if you’re one of those people you’re in luck because today I’m going to go over the reasons you aren’t traveling as much as you want & give you some tips on how to fix that. Go solo. Just because you can’t find anyone to go with you doesn’t mean you shouldn’t go. You don’t need a lot of money to travel, in fact there are many ways to travel very cheap or almost free. One of my favorite things to do is find luxury places on a budget. Which is why I love using Airbnb. 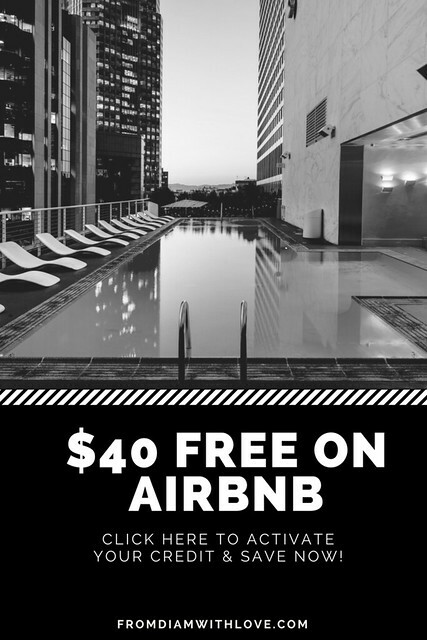 Why pay more to stay in a hotel when you can pay less and stay in a whole house or apartment? There are many great credit cards out there that offer up to 100,000 points which is typically enough for multiple roundtrip flights. It’s also worth it to join an airlines loyalty program (it’s free) that way you can earn additional points when traveling with that airline. Some also offer companion passes, which basically allows you to fly one person with you for free (this is a great way for couples who travel together to save money). Go on a staycation! You may not have time to go on a 2 month excursion through Asia right now, but traveling out of the country isn’t the only vacation option! Traveling also doesn’t have to be long and far, you can take a trip in your own backyard. I’m fortunate to live in Florida, so I can drive a few hours and be at a different beach with a different vibe. You could even book a weekend at an indoor waterpark, resort, cabin whatever you like! What do you like to do? Find it near you and enjoy it. If not now, then WHEN?! What’s holding you back from traveling more? Enjoy this post? Remember to Pin, Share, and tweet it! You are so right! I throw my dogs in the car and take off all the time and I hear “I wish I could do that” all the time. I’ve just signed up for my first Airbnb in a couple of months so we’ll see how it goes. It’s a bit of a mental thing getting over staying in a strangers house but as you pointed out, the cost difference is significant. I’m lucky in that southern Ontario has everything you could want (depending on the time of year) so there’s no reason not to travel at least a little. I’m guilty of all the ‘excuses’. But I’m gonna take your advice now. This is so true. We all use these excuses. You can find time for travel and I always look for discounts and ways to save money when travelling. I never used Airbnb but that’s something I’ll definitely look into for future travel. Great post. Tip: I read that flight prices are usually cheaper on Tuesdays. Thanks! I’ve read that before also! Love this post! So true! I’m from South Australia and it’s really easy to get in the car and drive to many different beautiful locations for a quick get away, you can even pack a tent and pay as little as $10-20 a night for accomodation in Caravan Parks. My mum did this with me and my sister our whole childhood, we always went on holiday that way and it didn’t break the bank for mum. Luckily, similar to you living in Florida, we have many beautiful beaches everywhere so each summer we would find a new one to go camping at! Yes! There is always a “reason” for others not to travel. We are all over Florida when we don’t want to road trip across the country or travel abroad! Great post. I’m over at http://www.3busybees.com if you ever want to check my work out. So true! I absolutely LOVE airbnb! We’ve used it every single time we’ve traveled internationally (except when we’ve stayed with friends). It really does make a huge difference. We stayed in a PHENOMENAL apartment (by ourselves) in Paris for $60 a night. Great location. Yay!! I used it in Paris 2 weeks ago too actually! It’s so much better than being in a hotel. It’s authentic. Such a great concept. Thanks for reading! You might have enough money and time and you also need to have a courage to leave the life you know behind, leave your comfort zone and put yourself out there to explore the big world. I think it’s definitely down to a change in mindset that shifts your travel dreams towards reality. When the desire to travel starts to build it often becomes harder to ignore and you tackle the road blocks you previously placed in your way until there are no barriers holding you back. Very lucky! I would do it every weekend if I lived there!